Master shipwright at HM Dockyard Deptford. He left £200 to the poor of Deptford which was invested in land on Church Street and provided an income to maintain schools. The Addey School was built here in 1821 and enlarged in 1862. It amalgamated with Dean Stanhopes School and moved to New Cross Road in 1899. Addey was buried in St Nicholas Church and there are plaques to him on the exterior north wall (see below). Near this place rests the body of John Addey of this parish one of the King's master shipwrights who departed this world in assured hope of his ressurection the 16th April AD 1606 age 56. His tomb being demolished this stone was erected at the expense of the parish January 1788. In the lower corners shipwright' s tools are depicted. Above the inscription is a wooden ship. 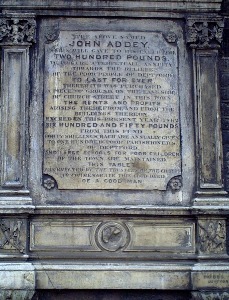 The name and date of JOHN ADDEY is on a stone laying flat on the other side of the doorway.